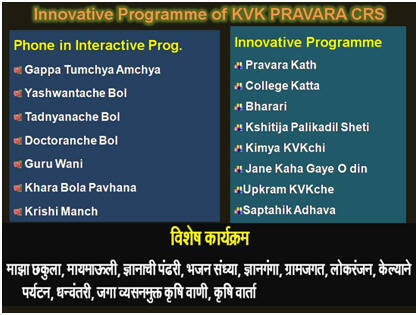 Besides these programme KVK also conduct various innovative programmes on Sunday like Kimaya KVK chi (wonders done by KVK) where the successful and more innovative technology adopted by farmers is being interviewed on the related topics. Similarly programme like Paravarchya Gappa (discussion of farmers in village) where the important burning issues which are discussed in village among farmers is being recorded and broadcasted. Similarly one day Friday is kept especially for the women in agriculture programme. Saturday is reserved for the broadcasting of programmes on successful agripreneurs. Besides these programmes 30 minutes daily programme is being broadcast on season based agriculture technology, success stories and agromet advisory services. Programmes like College Katta, Bharari, Guruvani, Doctoranche Bol, Gappa Tumchya - Amchya, are very innovative and more attractive programmes of CRS due to which listeners of the CRS has been increased. Under the 30 minutes programme format of ‘Our Farm, Your Technology’ mostly live and interactive sessions and talks are developed. Every Monday live phone in programme is broadcast as Hello Yashwant (most successful and innovative farmer) where the farmers are interacting with the farmer at on- air studio of the radio. On every Tuesday, scientists of the KVK are present in the studio and extend answers to the questions asked by the farmers. On Wednesday, a special programme is broadcast which is based on the development of 10 to 15 series of the dramatic programme on agriculture technology. The programme’s name is Bandhawaril Gappa (discussion on the bunds of the field) where experts are discussing the topic with the three to four farmers and farmwomen. On Thursday, the programme is based on testing of the knowledge of the people about the technologies on different commodities. The programme’s name is Khara Bola Pavhana (give correct answer) where the representative of the CRS asks questions to the group of Farmers Club, SHGs or Commodity groups to test the knowledge of the particular topic given to them. After giving of the correct three answers, a reward like an important agriculture input is being given to them. On Friday, Krishi Manch (a programme on discussion and debate on the important issues and concerns of the community is broadcast, it involves the expert from development department, representative of farmers and members of community. Representative of the KVK is as the anchor of this programme. This programme helps to provide deep insight into the problems and issues of community and raises them in this forum. Local burning issues and important problems are being discussed in this programme. On Saturday, time is spared to review the weekly technical problem and solutions given by all SMSs during the week. The programme is named as Saptahik Adhava (Weekly review). It involves the SMS providing advisories and information on problems raised by the visiting farmers and the answer given by SMS. This helps to take review of queries and provide answers to farmers’ queries during the week. Discussion on agricultural situation is being held during the weekly review. Sunday is kept specially to broadcast the programmes of KVK activities conducted during last week and next week proposed activities. This helps the farmers to update the events at KVK. In this way, the KVK plans all programmes which essentially communicate the information by creating the interest amongst the farmers. This has helped to increase the response of the farmers to these programmes.